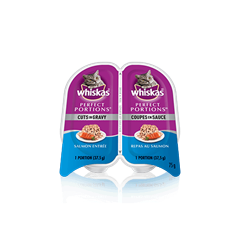 WHISKAS ® PERFECT PORTIONS™ Chicken & Tuna Entrée is rated 5.0 out of 5 by 1. 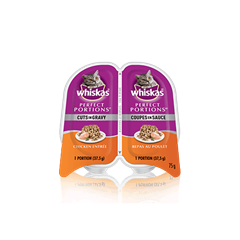 Rated 5 out of 5 by sweety from Perfect portions more like perfect food my cat is 11 years old and i always give her a mix of dry and wet food ever since i tried perfect portions it is the only brand that she licks off the plate clean. any flavour although she prefers the tuna ones i can be certain she will finish. i am never buying an other kind again. 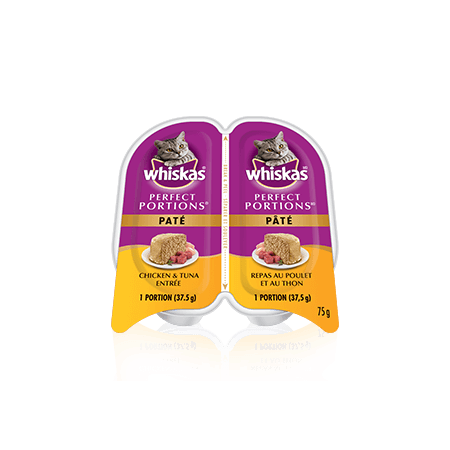 CHICKEN, CHICKEN BROTH, TUNA, CHICKEN LIVER, POULTRY BY-PRODUCTS, MEAT BY-PRODUCTS, VITAMINS AND MINERALS, GUAR GUM, COLOUR, SODIUM TRIPOLYPHOSPHATE, FISH OIL (PRESERVED WITH MIXED TOCOPHEROLS), dl-METHIONINE, SALT, TAURINE. 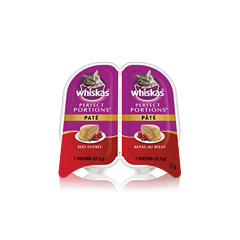 WHISKAS® PERFECT PORTIONS™ Paté Chicken & Tuna Entrée is formulated to meet the nutritional levels established by the AAFCO Cat Food Nutrient Profiles for all life stages.